KATIE: So Waffles... Have you packed your picnic lunch? WAFFLES: No? Wait! We're going on a PICNIC??? KATIE: Glogirly says that since the weather is nice we're going to have a picnic outside on the deck. 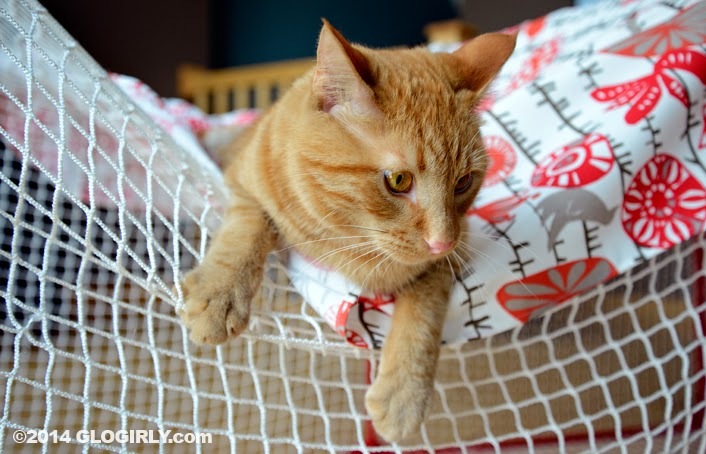 WAFFLES: But we don't have a picnic blanket! We can't have a picnic without a picnic blanket. KATIE: Waffles, we don't need a blanket. We're going to hang out in our Kritter Kondo. Remember? We wrote a blog post about it in January. It was snowy and cold so we had to have a picnic INSIDE. WAFFLES: Oh yeah. We had our picnic by the piano. KATIE: And you got in trouble for jumping on the piano keys. WAFFLES: Only because I had chicken on my paws. WAFFLES: Ok, Boss. I think it's just about ready to push outside. KATIE: Now Waffles. Before we go, remember what I told you about this center line. WAFFLES: I know, Boss. Don't cross the line. KATIE: And which side of the line is yours? WAFFLES: Right, yours is mine. WAFFLES: So Boss, who's side is THIS??? Learn more about our Kondo at the Kritter Kommunity. 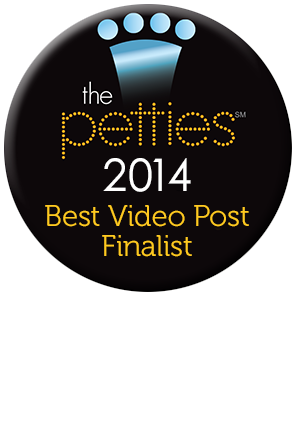 Thank you so much for all of your Petties nominations over the past month! We have great news. We're finalists in the Best Video Blog category for one of our Happy Birthday videos! It's an especially fun video. 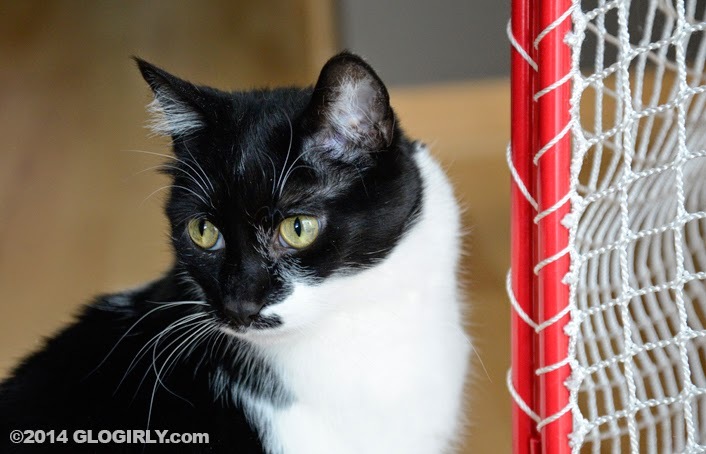 Not only do you get to hear the REAL Glogirly & Gloman sing a cappella, our video features 16 of our cat-blogging kitty friends. ConCATulations on being nominated for best video blog. I will vote daily. Congratulations - although I still think you was robbed! What a punchline. Oh I hope you guys get outside, the fresh air is so much fun. MOL! 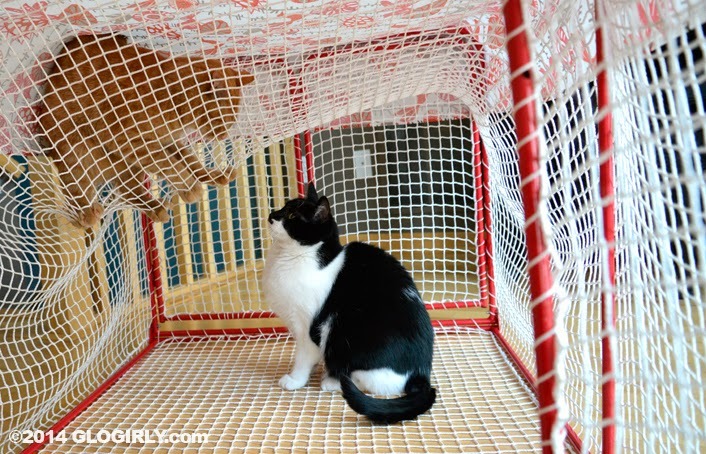 Waffles is quite creative in his condo use! I don't envy you, Katie, that's for sure. MOL Waffles, dat looks like somefin me and Crockett would do! Oh I do remember your indoors picnic with your Kritter Kondo. Grats on being a finalist! Hope you guys win! Oh dear, Katie! 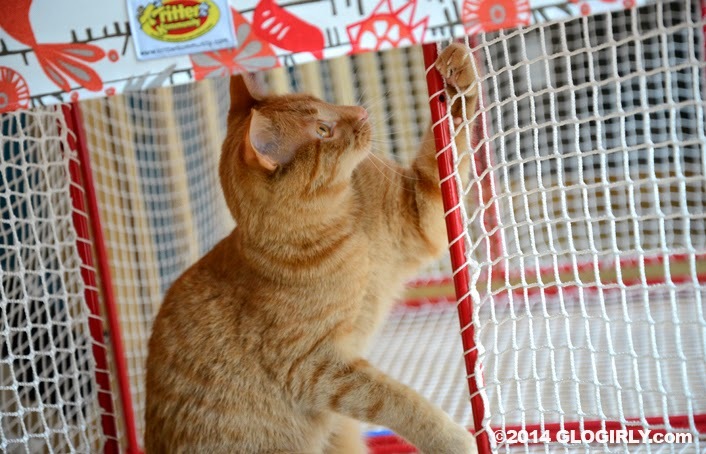 Maybe Waffles will stay up there in the netting while you eat!!! Concatulations on being a finalist!!! We expected you to be a finalist in more than one category too!!! We have already voted & will keep doing so. A picnic outside? How cool!! Congratulations! 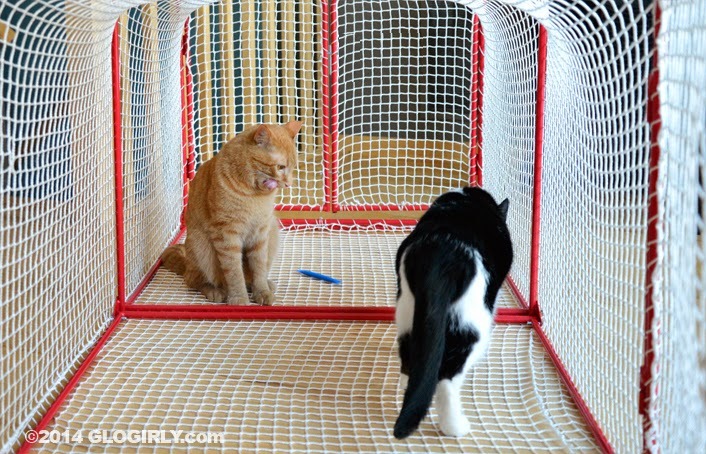 Although you're my favorite humor blog... Did you have to rescue Waffles from the netting? We need one of those Kritter Kondos so we can have some fun like that! Congratulations on your nomination! We'll be voting for you! A picnic sounds like fun!! Enjoy! Very creative, Waffles ;) Congrats on your nomination! We voted for you :) Enjoy your picnic. How cute. Hav fun on yous picnic. Lovin' the condo life eh kitties? WAffles you are just tooo cute! Hope you will enjoy your picnic outside !! Congratulations on being a finalist!! I just voted for you for Best Video Post. I'll continue to vote often - Good Luck!! Hey Katie, tell Yogi his Boo Boo is missing! Poor Katie, your patience must be worn thin....! Looks like Waffles is just hanging around. Oh you two always make my day. Waffles you are a case for sure. Concatulations to you! Good luck! Did you get to go outside, Katie?? That thing looks HUGE. Enjoy your whiffies. You have my permission to use Waffles Park It Mat as your picnic blanket. MOL! Oh, and big concats on the Petties! Hope you win. I’ll be voting. Congrats on your nomination. Voted for you. Waffles always getting into something. LOL. Your Kritter Kondo looks lots of fun but Waffles doesn't seem to have quite got the hang of it yet. Hahaha, that Waffles is a caution! Concats on being an awardie finalist. So where are the outside pictures! Man, that thing looks like so much fun!! Concatulations on being a Pettie finalist!! Yay on your nomination. We will run right over and vote all we can! Katie Katie Katie..I don't know HOW you deal with the Kid like this! !